The Commission’s programs help bridge the financial gap for qualified buyers who need a little help. By partnering with us, you can reach more clients and help more families achieve the dream of homeownership. 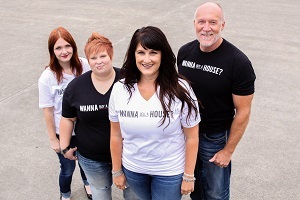 “We continue to have great success getting people into a home of their own with these Commission programs.“ --The Lipinski Team, Vancouver, Wash.
You can connect renters with the boost they need to become homebuyers. We work with a wide range of loan types—and we offer assistance with the downpayment and closing costs. Northwest MLS members: New! Now there’s an easier way to connect homebuyers with downpayment assistance! Who can use your programs? Take our training. Our monthly trainings tell you everything you need to know about our home-loan programs. You’ll earn six clock hours for continued education—plus, you can become an instructor of our homebuyer education seminars. Invite us to your office. We’re happy to come and meet with you or give a presentation to you and your colleagues. Why should I teach homebuyer classes? Every homebuyer who uses a Commission home loan must take one of our free seminars. As a real-estate professional partnered with a Commission-trained loan officer to teach the classes, you can connect with first-time and repeat homebuyers who are just starting the process, and expand your client base.